Bar codes are the most popular of the automatic data entry methods. It is a pattern of parallel bars and spaces of variable widths arranged in a specific predetermined pattern to represent a corresponding number, letter, or symbol. The information in a bar code is contained in the relative thickness and relative position of the lines and spaces within the specific data characters. Scanners convert the bars and spaces into usable information for data entry. Bar codes streamline data entry. They are used to increase the speed and accuracy of reading and entering data. It is primarily intended as a machine-readable data management system. Bar codes have received wide spread acceptance because of their low susceptibility to errors in data input. The error rate in human reading of hand written data is 7-14%. The error rate in human reading of preprinted data is 1/300 characters. There is a one in two million error rate for scanner read bar codes. It is considered the most effective data entry method. Most new bar code installations have a payback of less than one year. Credited with accuracy, speed, control, reliability and portability, bar code technology is the most popular method of tracking and transmitting data and is replacing other methods of tracking and transmitting data. Bar coding is a $4.4B market worldwide ($2B in the US). The U.S. market forecast is 14% CAGR over the next 5 years. Forecasts estimate bar code label sales will grow 10 – 15% annually, with fewer than 10% of potential applications installed. UPC, CODE 39 and Code 128 will outdistance all other linear codes. Codes with higher data density, especially new codes, have the greatest growth potential. All industry segments are experiencing fast growth. In industrial and business-to-business settings, there are four applications that are common to all businesses: materials management, information management, labor management, and asset management. 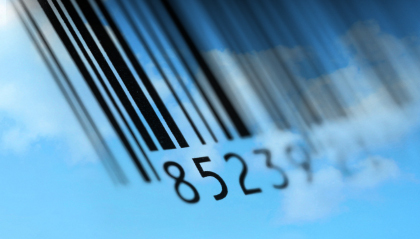 The use of bar codes is rapidly increasing in document management. Documents are either filmed or entered into an electronic imaging system. Automatic data entry can be provided with bar coded documents (i.e. the bar code could contain an invoice number a number of pages, and a page number). Since bar code reading is highly accurate, less data entry errors will occur and faster data entry will result. Data that can be entered automatically can be either numeric or alphanumeric depending on the bar code symbology selected. Document sorting can also be reduced if a document code is included in the bar code. A bar code should be considered as an alternative to OCR in many indexing applications. Standard bar codes are read by a light source, illuminating the bars and spaces. This involves moving the read head over the code symbol, or if the read head is in a fixed-position (as in the supermarket), then the code is presented to the read head. The light is absorbed by the black bars and reflected by the white spaces and/or background, in a specific sequence with orientation being determined by the start and stop codes. A sensor detects the reflected light from the spaces and produces a “high” signal output for each space and a “low” signal output for each bar where the light has been absorbed. The duration of the high and low signals indicates whether the bars and spaces are wide or narrow. The thickness is always in reference to a line or space contained with the bar code. The reference thickness is called the “x” dimension, or the narrow element width. It is then necessary to determine what this pattern of wide and narrow elements symbology is to decode the bar code. This is accomplished with decoding software. The decoder performs 4 basic functions. It times the duration of the electrical pulses and classifies them as wide or narrow bars or spaces. A determination is made regarding which bar code symbology is being used. Once this is done it translates the bar and space pattern into the actual characters that make up the bar code. The last function is to transmit the bar code data to some other device that will use the data. Transmitting the data through a computer interface to various computer devices usually does this. The data stored in the bar code is a unique identifier that provides access to data stored in a central computer system. By keeping the data separate from the bar-coded identifier and centrally located, you also simplify updating the information. However, the “license plate” method only works if everyone has access to the same database. This is not usually a problem for internal operations; when the code crosses into another environment, the database may not be accessible. Encoding the data is achieved by creating a pattern of narrow and wide bars and spaces. There are two encoding methods for traditional linear bar codes: binary coding and proportional coding. Two sizes of bars and spaces are used to encode data (i.e. the wide bar or space is about 2 to 3 times wider than the narrow bar or space). You can easily convert the bars and spaces into binary code, which can then be converted (using a table) into ASCII characters. An example of a bar code type using this encoding technique is Code 39. There are many different sizes of bars and spaces. The size of the bars and spaces and the sequence of bars and spaces define the characters represented. This code is more difficult to read (no easy translation to binary is possible) and more accuracy is required in printing and in scanning the bar code. In general, 3 – 4 different widths of bars and spaces are used to encode data. An example of a bar code symbology using this encoding technique is Code 128. 1. A fixed number of bars are used per character. This means that if a bar is not read, the bar code will become unreadable. 2. The number of possible characters that can be encoded in a certain bar code is so high compared to the number of valid characters. This means if the size of one of the bars / spaces is misread, an illegal character will be read. Therefore the character substitution rate becomes very low. In conclusion, bar codes are highly secure. Errors in reading are highly unlikely. Either a bar code can be read or it cannot be read at all. There are over 50 different bar code symbologies each having their own symbol interpretation. Currently, there are only a few code symbologies in wide spread use. Code symbol density ranges from low to mega-density. Low-density symbols have fewer than 3 characters per inch. High-density symbols can contain 100s of characters per square inch. Code symbologies are classified as linear or two-dimensional. Two types of symbology structure, discrete or continuous, define all bar codes. Linear codes are those in which characters are grouped, one next to another, in one linear direction (put in code 39). Simply put, a single row of parallel bars and spaces. While linear bar codes are two dimensional, having both width and height, they are one dimensional in scanning. Only the widths of bars (and sometimes spaces) are measured to interpret the symbol. The height of the code is simply redundancy to enable scanners to more easily scan the symbol. These are most commonly known as “bar” codes. These include UPC, Code 39, Codabar, Code 128, Interleaved 2 of 5, and 2 of 5 code. There are three main discrete bar codes used in North America: Code 39, Codabar, and Code 2 of 5. Characters in these codes begin and end with a bar. This construction creates spaces between characters that are not part of a character. This inter character gap should be approximately equal to the narrow bar width. Codes with this inter character gap are called discrete since each character is separate and independent from other characters in the same symbol. Because of this inter character gap, impact numbering machines can be used to print bar codes since the space of the inter character gap can be used for ratchets for the individual number wheels in a numbering head. These ratchets are essential for impact numbering devices. Code 39 was the first alphanumeric code and is the most common non-retail symbology. It is a 43 character alphanumeric binary code (most other discrete codes are not alphanumeric). This bar code is capable of representing all capital letters, numbers, and the seven special characters./+%$- and space, and can easily be printed by a variety of technologies. Code 39 is a two-width symbology; meaning all bars and spaces are either wide or narrow. Each character is composed of nine elements; five bars and four spaces. Three elements are wide (two bars and one space) and six are narrow. Each code begins and ends with an asterisk, which is this symbology’s start/stop code. Code 39 is self-checking; meaning any element erroneously printed or scanned will not result in bad data input. An optional check character is available. Code 39 is the standard symbology for the federal government, automotive industry, and the material handling industry. It is the code of choice in most situations that require alphanumeric coding. It is bi-directional. The maximum density is 9.8 characters per inch. Minimum bar ratio is 2.0:1. If the “x” dimension is less than .02 inches, the minimum ratio should be 2.5:1. Maximum bar ratio is 3.0:1. Although there are only 43 data characters in Code 39′s character set, it is possible to encode all 128 ASCII characters using Code 39′s full ASCII feature. If a reader is in its full ASCII mode, the symbols $ / % and + are used as precedence codes with the 26 letters. The extended 3 of 9 code is a general-purpose code that can code any ASCII character (any character you can enter from the keyboard by normal means). This code is double the size of the standard Code 39 as it uses two code characters for each of the 128 ASCII characters. As with the standard Code 39, data can be of any length. LOGMARS (Logistics Applications of Automated Marketing and Reading Symbols) is a special application of Code 39 used by the U.S. Department of Defense and is governed by Military Standard MIL-STD-1189. The Standard defines acceptable ranges for a number of variables including density, ratio, bar height, and size of the human-readable interpretation line. The Modulus 43 check digit, optional with Code 39 is defined and recommended in the specification. While not required by the general specification, it may be required in specific Department of Defense applications. The Zip+4 code is used by the post office for sorting letters. The code is made up of tall and short bars with even spacing between each bar. Zip+4 uses eleven digits plus a correction digit. The check digit is used by the Post Office’s bar code reader to identify errors. The data for the code is the nine-digit zip code plus the last two numbers of the street address. If the nine-digit zip code is unavailable, five-digit zip can be used. CODE 11 is a numeric, high-density code with one special character, the dash (-). Each character is encoded with five elements either 2 wide and 3 narrow, or 1 wide and 4 narrow. Code 11 uses 2 check digits. This code was developed by Bell Labs and is used primarily in the telecommunications industry. Also known as USD-4, NW 7, and Code 2of 7, Codabar is a self-checking, numeric only code. It is a bi-directional code. There are 16 characters in the set, 10 digits plus special characters ($-,/ and +). The start/stop characters A,B,C,D,E,*,N, or T must be used in matching pairs and may appear elsewhere in the bar code. Each character is coded independently by means of four bars and three intervening spaces, totaling a fixed width but employing a complex set of individual bar and space widths. It was originally designed for use in retail price labeling. It was one of the original proposed symbologies for the UPC. Instead, it found a niche in several diverse, non-retail applications. It is the code required by the Department of Defense. Other applications include inventory control, libraries, blood banks, photo finishing, and air bill applications. The maximum density is 12.8 characters per inch. The minimum bar width is .075″. Its specifications allow it to be printed with wide quality tolerances. That is why it was used for package tracking. There is no checksum defined as part of the Codabar standard, but some industries (libraries, for example) have adopted their own checksum standards. In use since the late 1960′s and is supported by several equipment suppliers. It is used less that Code 39 or Codabar. It is a numeric, discrete, self-checking bar code originally developed for automated warehouse sorting and Photo-finishing envelopes. 2/5 encodes information in five bars, two of which are wide with the remaining three narrow. All spaces separating the bars are about the same width and carry no data, so the code has a much lower information density than the interleaved 2 of 5. Its only advantage is a shorter impression length compared to Code 39 and Codabar. Other codes are called continuous and will not allow an inter-character gap. Consequently they cannot be used in impact numbering equipment. Interleaved 2 0f 5 is a numeric-only, bi-directional, self-checking code. It’s the most popular numeric only bar code in non-retail distribution. Its main advantage is its density. Each character is five elements…two wide and three narrow. There must be an even number of characters in this code. If there are an odd number of digits, a zero must be added in the most significant position. Bars represent odd-numbered digits and even-numbered digits are represented by spaces. This “interleaving” process, in which bars and spaces encode numbers independently, gives the code a higher density. I 2/5 is usually printed with a top and bottom border to prevent a partial scan being interpreted as a complete scan. I 2/5 is often used with a MOD 10 check digit. The standard ITF contains 14 digits, with an optional 6-digit suffix. The IT outer case code with the human readable characters at the base of the code, grouped into country code, supplier code, product code, and check digit. It is a recommended symbology for corrugated shipping containers and has been selected for use on other shipping containers in the grocery industry. It is used in this application to identify the trade selling as opposed to the consumer-selling unit in retail trade. It employs a data format standard identical to that of the regular UPC A code but with two additional digits at the front. The first is an assortment indicator used to indicate the type of selling unit (e.g., case or pallet) or for a single case where the five-digit item code portion matches the five-digit item code of the consumer selling units inside. Quite commonly, the five digits match. This is not possible when there is more than one trade-selling unit for the same consumer item, or where the trade-selling unit contains an assortment of consumer selling units. The second extra digit is always a zero, provided to make the format compatible with EAN. The code value, as specified by the data format standard, is more widely used than is the bar code symbology. In distribution, sorting and shipment control are usually exercised according to shipment number ID rather than stock keeping unit (SKU) ID. On the other hand, the UPC shipping container code number is the standard way to identify items in a purchase order, shipping advice, invoice, etc. when transmitted between parties using UCS, the grocery industry’s EDI standard. Though its major application is considered warehouse inventory, it has been accepted in airline ticketing and baggage and cargo handling. N,K codes are a different type of continuous bar code symbology, which provides greater symbol density. N,K code is proportional, allowing elements to have multiple widths, not just two widths. These symbologies divide the region occupied by a character into N modules. Each bar and space may occupy one or more modules. K refers to the total number of bars and spaces in a character. Version A is a 10-digit code: the first five digits represent the manufacturer of the labeled item, and the next five digits are a unique product identifier code. This 10-digit code is preceded with a “number system” digit. Most products will either have a “1″ or “7″ in this position. It signifies that the product is of a fixed weight and size, as opposed to a variable (i.e. apples) or a product coupon. A Mod 10 DR check digit that is based on the preceding 11 digits of data follows the UPC code. To make matters more complicated, the publishing industry has added a supplemental 2 and 5 digit symbols to the end of the UPC-A symbol. This supplemental symbol contains date-of-issue information or a price. UPC-E is a shortened and more complicated for of UPC-A, representing a full ten digits using only 6 characters. UPC-E was developed to aid manufacturers who could not fit an entire 12-digit symbol on their small package. A limited number of these symbols were issued, the last of which was given out years ago. UPC-D is a version used for variable length messages. It is very seldom used. The UPC code currently used will be replaced by EAN. EAN, initially known as “European Article Numbering”, is gaining worldwide retailing acceptance. In the US its use is largely limited to the encoding of books, though all retailers will adopt the symbology by 2005. EAN-13 encodes 13 digits, one more than UPC. For more information, contact the UPC Code Council at (513) 435-3870 or http://www.uc-council.org. This Council issues the manufacturer and product code numbers used in this symbology. Code 128 is an N,K code, one specifically designed to encode the entire 128 character ASCII set. This character set includes special control codes necessary for computer communication. The symbology is denser than Code 39 and includes a check character instead of the optional check for Code 39. Each character is encoded by means of three bars and three spaces with a combined width of 11 modules or units. The total length of 11 modules is made up of an odd number of bar modules and an even number of space modules. The bars and spaces may be 1,2,3, or 4 modules wide. This coding system provides 106 different print characters. Four bars and three spaces define three stop/start characters. Each character requires only 68% of the space required in Code 39 characters. The symbology provides for three different character sets that are identified by distinct start characters: A, B, or C. 128 C consists of the 100 two-digit pairs 00 through 99. This allows the effective density of 128 to be doubled when printing all numeric data. This provides a maximum density of 24 characters per inch. 128 A and 128 B cover the entire 128 ASCII character set, with a considerable amount of redundancy. 128 B includes both upper and lower case letters as well as numbers and some special characters; 128 A emphasizes the full set of special characters but excludes the lower case letters. As a result, the code can be quite compact when expressing numbers only, yet fully capable of providing all needed ASCII characters as and when needed. Code 93 is a specially designed code incorporating nine “n” modules, each having 3 bars and 3 spaces. The bars and spaces may be one to four “N” modules wide. Code 93 as designed by Intermec (designers of Code 39) to address density demands by users. Code 93 normally utilizes the same character set as Code 39, but special versions use the complete ASCII file. Code 93 utilizes 2 check digits and has a higher density and Code 128 versions A/B. Chanel code is available in six sizes (channels-the number of spaces and bars used to create a single character, each with a different data capacity. The smallest, Channel 3, can encode up to 26 characters in just 17 “x”. The largest, Channel 8, can encode up to 7,742,862 characters in 37 “x”. The code requires only a 1″x” quiet zone. The code can be used with all standard scanners, however, users must modify standard decoding hardware. Potential applications include jewelry, electronics parts, ID cards, serialized parts and other small items. These symbologies utilize narrower module width to pack the maximum amount of machine-readable information into the smallest possible area. Mega density bar codes are expected to be compatible with current symbologies and to be capable of being readable by existing scanners. High-density and mega-density bar codes promise growth in marking medicines, jewelry and other objects too small to be marked with traditional codes. Some high-density codes, such as Code 49, are in use today. It carries the same message as Code 39 in one-sixth the space. Portable information databases (PDBs) are small, self-contained and universally readable. Floppy disks, CD-ROMS, smart and optical cards are portable databases. These are ideal for distributing large databases that remain relatively unchanged. But, because of their size, they’re not good for applications where the database must move along with the object of the data. Printed PDBs work well for applications where real-time information updates are not critical. They also fit applications where the database information is only required at the location of the object of the information (i.e., packing list). There are more than a dozen mega-density codes appropriate as PDBs. One reason to choose a printed PDB over an alternate is to save space. Another reason is cost. Since the database is printed either on a label or directly on the packaging or object, the cost to provide the database is small. Printed PDBs also have advantages over EDI. With PDBs, the data is available when and where it is needed. Typical EDI problems including phone links, data transmissions, potential data transfer delays, etc. don’t exist with PDBs. They offer the opportunity to create “intelligent” forms and or labels. Linear codes are used primarily for identifying items. This has been traditionally through a “license plate” concept of assigning bar coded numbers to documents or assets. Linear codes are typically 12 characters or less. This has largely remained an intra-organization system, because the data base behind the bar coded identifier is within the organization. As such, the assigned bar code numbers have no meaning to others who may scan them. Additionally, linear codes are not practical for storing large volumes of data. A 2D code allows more data to be encoded in a variable length message. More importantly, 2D codes have actual data, not just “license plate” numbers linked to data stored in a remote database. Two dimensional (2D) bar codes are printable PDBs. They are stored on paper instead of floppy disks. Many of the 2D symbols can carry 2000 characters of data in a single symbol as compared to a regular or linear bar code capacity of 10 to 22 characters. 2D symbols can also carry binary data, which can be made to run a computer program or generate photographs and drawings, such as passport photos, fingerprints, and signatures. Scanners used to scan linear bar codes, are not typically capable of reading 2D bar codes. Two options are available for scanning 2D codes. The first involves a moving laser beam which scans both horizontally and vertically to capture the entire code image. The second option, a CCD (charge couple device) scanner utilizes a two-dimensional array of photo sensors to capture the entire code image. Two-dimensional bar codes are defined as stacked or matrix (pattern). Probably the most fascinating thing about 2D symbologies is that most can accommodate advanced data redundancy and “error correction methods” (error correction can be defined by the user). By mathematical formulas embedded in the code, data can be mixed in predetermined ways, so the information from a single input/output character is distributed along with other data over pixels scattered over multiple locations. As a result, when the code is damaged “error correction” will “reconstruct” missing portions of the symbol and recreate the missing data. Up to 50% of the label can be destroyed or damaged and still retrieve 100% of the data contained in the symbol when it is scanned. Damage can include worn out and scratched areas, horizontally and/or vertically cut areas, hole punched areas, and folded areas. This is very beneficial for use in environments where symbol damage is likely. Stacked codes are constructed of rows of individual characters (that can be individually recognized) including stop/start characters that are stacked upon one another. It also contains an element telling the scanner where it is when it’s reading the code. Stacked code is easier to print and read than matrix code. Like standard linear bar codes, the scanner looks at the width of bars and spaces to read the code. Code 49 was the first two-dimensional symbology that could be read by traditional scanners. This symbology can encode 49 alphanumeric characters or 81 numeric characters in 1.25 x 1.25 inches. It employs a fixed-width, variable-height (two to eight rows) pattern. Each row contains eight characters, with each character having 49 possible values (hence the name of the code). Various shift characters, row number identifiers, and check characters add overhead but provide data security and the ability to efficiently encode numeric strings, upper case alphas and numeric, or full 128 ASCII character sets. Codablock MLC 2D is the simplest of the high-density symbologies. It uses Code 39 and is stacked with narrow rows. It can contain 70 alphanumeric characters in 1.25 x 1.25 inches. Code 16k has 37 alphanumeric characters or 74 numeric characters. It employs a fixed-width, variable-height (2 to 16 rows) pattern. It is derived from the Code 128 symbology, employing a mirror image of that encodation pattern. It Has a higher capacity that Code 49, and can be used in applications requiring lengthy instructions. Symbol Technologies developed PDF 417 and was awarded patents in 1992 for the code design as well as the scanner design (5,1133,445, and 5,243,655). Symbol Technologies has placed PDF 417 in the public domain. PDF 417 (portable data file 417) is a continuous type stacked symbology. Each stacked row contains start/stop patterns and data units called “words.” Each “word” consists of 4 separate “bars” and four separate spaces. A “word” is 17 pixels (modules) long. The 17-pixel (module) string is divided into the four separate bars and four separate spaces by linking up to six consecutive pixels (modules) into bars, and linking up to six consecutive pixels (modules) into spaces. Normally, each word value can be encoded to represent a pair of characters. Through the use of special shift characters, each word can have several meanings depending on its position and mode. Rows of words are stacked in columns. There must be a minimum of 3 rows and a maximum of 90 rows per symbol. There must be a minimum of 1 data column and a maximum of 30 data columns. Every PDF 417 symbol contains two error detection code words that are used like the check digit in linear bar code symbologies to detect/decode errors. Additionally, PDF 417 provides error correction in the event that portions of the symbol have been damaged. There are nine levels of security available in PDF 17. The higher the security level, the greater the damage than can occur and still obtain 100% recovery and readability. This coding format creates a total of 10,480 possible “words.” but only three sets of 929 “words” are used in an application. The entire set of words is divided into three mutually exclusive encoded sets, or “clusters”. Each cluster encodes the 929 available PDF417 words with distinct bar-space patterns so that one cluster cannot be confused with another. Each row uses only one of the three clusters to encode data, with the same cluster repeating sequentially every third row. The system iterates among these three sets from word to word, in order to keep track of position. Because any two adjacent rows use different clusters, the decoder can stitch partial scans while decoding a very high-density symbol. PDF offers three data compaction modes. Each mode defines a mapping between word sequences and user data. One is binary compaction mode, the others are extended alphanumeric compaction mode (EXC) and the numeric compaction mode. In each row of a symbol, the first and last words are row indicators. Each symbol requires parity words. For each symbol, the user can define error correction capability of up to 510 words. In a relatively “clean” environment in which damage to the label is unlikely (e.g. an office), truncated PDF417 can be used; this version omits the right row indicator and simplifies the stop pattern into a single module with a bar. This reduces the non-data overhead, with some tradeoff in robustness, or the ability to withstand noise, damage, degradation, dust, etc. Truncated PDF417 is fully compatible with the standard PDF417. PDF 417 can encode a maximum of up to 1850 ASCII characters, 1108 bytes of binary data or 2725 compacted numeric characters in a single symbol. Data density is approximately 1374 bytes per square inch with ASCII characters, 837 bytes per square inch with binary data. Density is about 30 times that of UPC A bar code. For macro PDF417, the above storage limits are increased to more than 1MM bytes in binary compaction mode and more than 2.5MM bytes in EXC mode. With appropriate data compaction, over 1kb of data can be stored per label. Additionally, images can be stored, including fingerprints and signatures. The height and width of PDF 417 is variable. Because rows can vary in length, and the number of rows can be variable, users can define the share or aspect ratio of the symbol, the X and Y dimensions of the elements, and the mode of the symbol. The minimum element width is 7.5 mil and the minimum height is 10 mil. Symbols may be stacked upon one another for almost unlimited data acquisition or truncated for smaller symbols. For applications whose storage requirements exceed the capacity of a single PDF417 symbol, Macro PDF417 provides a mechanism for transparently distributing the data among several PDF417 symbols. PDF 417 can encode ASCII, binary or numeric data and can communicate with any operating system. It can be bi-directionally scanned and can be decoded by the computer system and automatically do the document verification either on-line or locally. By applying image compression and encryption, PDF 417 is the best instrument to prevent document forgery. Applications include shipping/receiving (the code can contain the manifest of the entire shipment, eliminating the need for shipping documents; identification (a complete information profile of customers or employees including medical and personal information as well as a picture); direct mail (encode on return cards a complete demographic profile of each individual on a mailing list); instructions (the next step of a production process attached to each tool or part); tracking (instructions on where to place each piece), membership cards and licenses. Micro PDF, a much smaller version of PDF 417, allows the use of elements of the code to be printed as small as 4 mil and still be read by a special laser scanner, or 2 mil to be read by CCD cameras. Matrix codes have a checkerboard appearance, with each uniformly spaced square or polygon shaped cell corresponding to a binary bit. They are constructed of a mosaic of light and dark elements that must all be read before any characters can be recognized. Matrix codes contain bars having only one width, so the scanner must read the center of each bar to interpret the code. Matrix codes can store more information per unit area than stack code. Matrix symbols are encoded with a binary code requiring a special scanner. Softstrip has been around for some time. It was originally used to publish machine-readable computer programs in magazines. The strip matrix used employs “dibits”: pixel pairs coded black-white or white-black for the two binary possibilities. ASCII bytes are directly encoded as 8-bit sets, with check bits enabling some error correction. Different print densities can be employed, depending upon the precision of the print medium, ranging from dot matrix printers to high-resolution lithography. Softstrip needs special scanning equipment and decoding algorithms. It uses a pattern that can vary in length from one to nine inches. With an x-dimension of 9/500 inches, it encodes approximately 600 characters per inch. It is an ultra high-density printed code (strip), which contains between 0 and 500 bytes of information per inch, and most graphic printers can print the data strips. Datacode like Softstrip, is a matrix symbology requiring special scanning equipment and decoding algorithms. It uses a pattern that can vary in length from one to nine inches. With an x-dimension of 9/500 inch, it encodes approximately 600 characters per inch. Code 1 is considered an “area type” symbology that combines a checkerboard data area with a bar code-like locator pattern. It can label very tiny components as well as carry large amounts of information in larger symbols. This symbology allows the user to encode up to 2218 alphanumeric characters into a single symbol. Unlike many of the other 2D symbologies, Code 1 symbols can be shaped to fit in non-rectangular shapes like an L, U, T or other shapes. The symbol can be read with area array CCD cameras. Vericode and Datamatrix are usable like traditional bar codes as a “license plate” helping computers access a particular file of information. However, the symbol can also contain that information. Each square in the symbol is a data cell. Algorithms contained in each cell identify the information that has been encoded. Upwards of 2000 ASCII characters may be encoded in a symbol. This code is very popular for applications that require a very tiny symbol size. A typical matrix code can be made to hold 60 characters of information in a .12″ square symbol. A special 2D CCD reader is required.